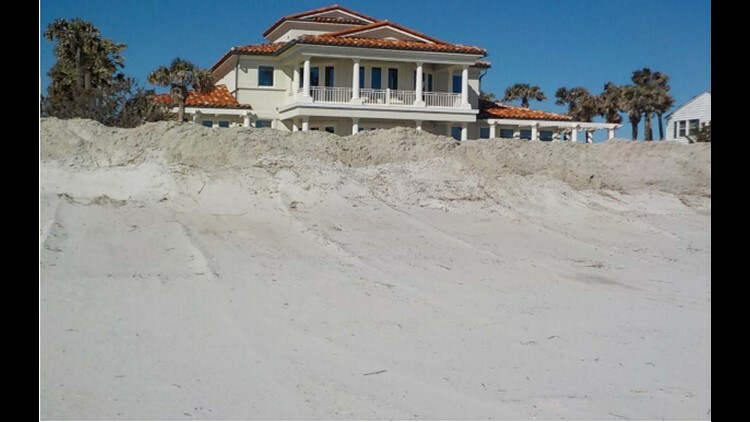 A letter was sent to Catherine Munoz, CEO of United Airlines Oscar Munoz's wife, from the Florida Department of Environmental Protection asking them to stop taking sand from the beach to create dunes in front of their $6.8 million Ponte Vedra home. According to the letter, a complaint was filed, prompting an inspection of the property on March 21, 2018 and it was evident that sand had been taken from the beach with machinery to create a "small frontal dune at the base of the original eroded dune." The Munoz's home was one of four which received letters from the DEP about removing sand from the beach to create dunes. The letter states that this violation of Florida State statute could result in liability for damages and restoration and civil penalties. The letter was sent to the Munozes on March 28 and it states that Catherine Munoz has 15 days to arrange a meeting to discuss the matter. Neighbor Bill Hudson, who lives a few doors down from Munoz, calls the beach scraping unfair and concerning. "The beach, you can look at it, it's in the process of rebuilding, nature's rebuilding it," Husdon said. "But all things like this do is disrupt the process." After Hurricane Matthew, Hudson said he spent around $28,000 to ship in commercial sand to create dunes to protect his beachfront home. Using sand from the beach would cost only a fraction, he said. "There's a cost to playing by the rules," Hudson said. "[The beach] is an asset to be shared and it's the responsibility of everyone that lives here to protect that jewel." Kevin Bodge, president of coastal engineering firm Olsen Associates, Inc. said the practice of 'beach scraping' was common during the early part of the 1900s, but improper practices eventually led to state regulation. "It was almost always abused because far too much sand was scraped," Bodge said. "If it’s done with a light touch judiciously, and with a permit, it can be helpful. However, done wrong it can ultimately damage the beach and harm adjacent properties." Bodge also said dune building done by a community uniformly along miles of beachfront is less problematic than pockets of homeowners acting alone. The department is committed to assisting homeowners recover from hurricane-related impacts as quickly as possible, while ensuring that as corrective actions and restoration activities are implemented for protection to the beach and dune system and private property, they also comply with Florida’s environmental rules and regulations. The department has been actively working to identify, investigate and address all non-compliant emergency/temporary beach-related activities and notify owners where further actions are required. As part of these efforts, the Department has sent Warning Letters to four St. Johns County property owners for sand scraping activities performed at their properties. These letters address noted potential violations during recent inspections. A Warning Letter is the first step in DEP’s compliance and enforcement process. This is part of the department’s efforts to gather needed additional information regarding the specific circumstances surrounding these activities to further evaluate the noted concerns from a regulatory perspective. DEP uses the information to determine if there were violations of Florida law. We will hold the property owner accountable if violations are found, by identifying necessary restoration and/or remediation actions with the possibility of fines or other penalties for damages as defined by statute and deemed appropriate. On Thursday, First Coast News attempted to reach the Munozes at their listed phone number and through United Airlines but did not receive a response.